Today was our first official day back to our “regular” non holiday schedule. Mike and I both needed to go to work and Lola stayed home to hold down the fort. I had a few errands and chores to get done, a walk for Lola while it was warmer and sunny, and then fighting traffic to pickup Mike. After all this, the temptation to grab a meal out was strong. Thankfully, I planned ahead and had a Dream Dinners meal defrosted in the fridge. When we got home, Mike and Lola played while I made dinner quickly. 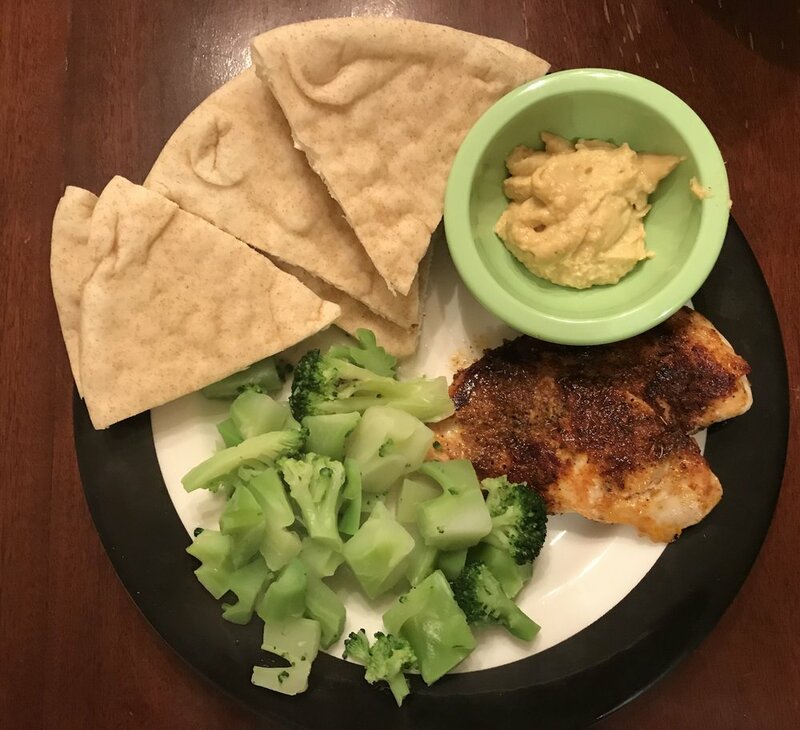 Tonight’s meal was the Southwest Chicken with Ancho Hummus and Pita, which I paired with some steamed broccoli. I started by preheating the oven to 350 degrees. I wrapped the pitas in foil and let them warm up in the oven. Meanwhile, I dried off the chicken and coated it with the rub. Next, I cooked the chicken about 7 minutes per side in a skillet over medium high heat. After everything had cooked, I cut the pitas into wedges pairing them with hummus, chicken, and broccoli. Dinner was served in about 25 minutes of prep time. Our meal was simple, but very tasty. The rub gave the chicken a nice zing along with the little kick of ancho in the hummus. We gave this meal 5 stars and would be happy to eat this again in the future.